Surge Components is a Deer Park, New York based distributor of capacitators and discrete semiconductors. Surge Components is exclusively a sales and marketing operation and leaves the manufacture of these components to other firms. The company is truly the tiniest of the tiny with a market capitalization of only $4.11 million. Surge Components’ share price has fallen 50% over the past year, even as the company produced profits and substantial free cash flow. At price of $0.425 per share, Surge Components trades at 63.7% of tangible book value. The company trades at just a slight premium to a conservatively calculated net current asset value. In addition to its current assets, Surge Components has $100,000 or so in fixed assets that have been depreciated on the books to just 4.8% of the original cost basis of $2.1 million. It is quite likely that these assets have higher economic worth. The company’s strong balance sheet provides support for the current stock price, but the company’s profitable operations suggest a higher valuation is warranted. Over the twelve trailing months, Surge Components recorded operating income of $1.12 million. GAAP net income was $2.36 million, but much of this figure is the result of the company reversing valuation allowances against deferred tax assets, a non-reoccurring gain. Assuming a normal tax rate of 35%, Surge Components would have earned about $0.72 million last year after accounting for preferred dividends. 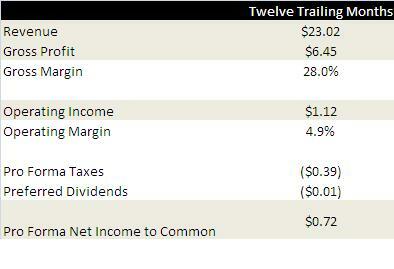 On a pro forma basis, Surge Components trades at 5.7 times trailing earnings. However, compared to the same quarter of last year, the company’s cash balances have increased by $1.53 million. Given that sales did not increase significantly, I think it is safe to assume that the $1.53 million consists entirely of excess cash. 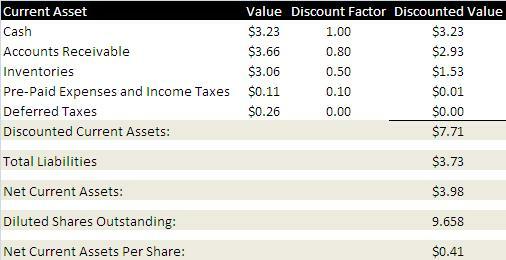 Net of this excess cash, the company’s pro forma P/E ratio is only 3.6. Some of the stock’s poor performance may be related to investor distrust. Though recent profits have been solid, the company has an accumulated deficit of $15.29 to date. Not exactly a world beating operation. Also, the company filed zero public reports from April 2004 to May 2010. Investors value transparency and assign discounted to companies that cannot be trusted to provide it. Executive compensation is another issue. In 2011, Mr. Ira Levy and Mr. Steven J. Lubman received $850,000 in compensation between them. Mr. Levy is the company’s President/CEO/CFO and Mr. Lubman serves as Vice President and Secretary. At the present time, these men own approximately $740,000 of company stock between them. Because the value of their stock holdings is less than their annual compensation, they may be more motivated to grow their own salaries and bonuses than to grow the market value of the company. Finally, the company’s ethical history is suspect. The company was originally delisted from the NASDAQ in 2002 due to questionable payments to a supplier that may or may not have been kickbacks. Mr. Levy and Mr. Lubman refused to respond to NASDAQ’s requests for interviews. On the plus side, respected microcap investor Paul Sonkin’s funds own just under 5% of the company, though he purchased at significantly lower prices. Despite the corporate governance issues, the attractiveness of the company’s modest valuation and significant excess cash is undeniable. A significant special dividend or share tender could send shares rocketing higher. I will be staying out, but an investor with a high tolerance for risk might find a lot to like.